If the Greeks have a version of comfort food like the Italian lasagne or the English Shepherd’s pie it is certainly moussaka. 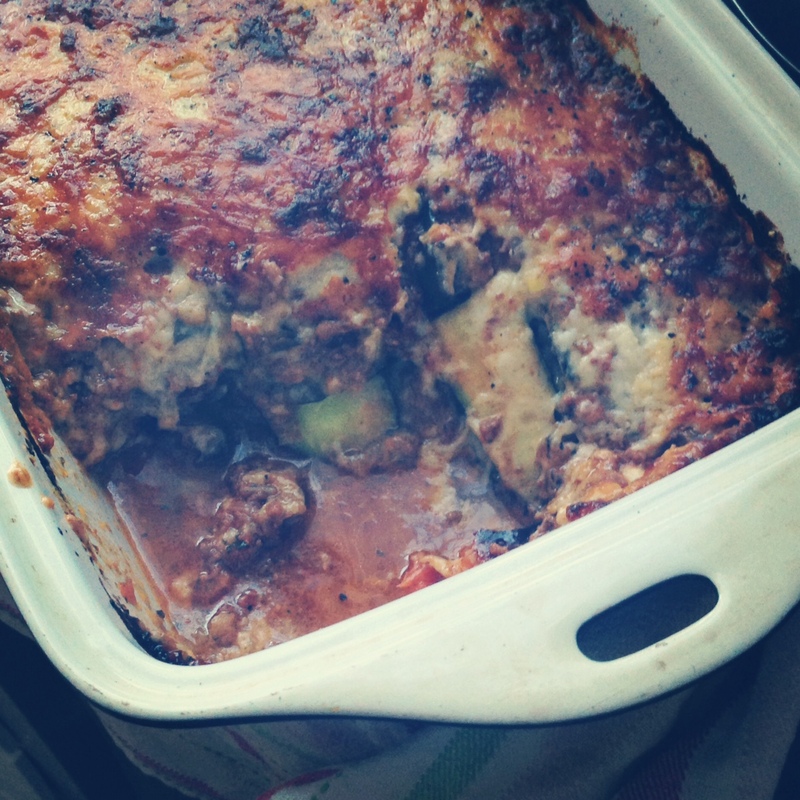 Layers of eggplant and zucchini, potato too if you like, with meat sauce and cheesy bechamel. There is nothing not to like. The authentic moussaka doesn’t always use the kefalograviera cheese that I use in mine but I find it to be an essential component. I suspect the Greeks themselves vary this dish according to what ingredients they have on hand anyway as it is definitely what we would call a ‘homestyle’ dish. In my perfect moussaka the meat sauce needs to contain a subtle hint of nutmeg and cinnamon, the eggplant and other vegetables need to be properly cooked and, finally, you need to use the Greek kefalograviera cheese in the bechamel sauce and sprinkled liberally throughout. Kefalograviera cheese is available at Greek or Mediterranean delis, I found mine at the Footscray market. It is the same cheese I use when making saganyaki for mezedes (see ‘Sometimes I Hear a Mermaid Singing’ in August 2011), you can imagine the result when it is melted through a moussaka. On the freezing day I made this I couldn’t stop at one serving and neither could my dining companion. This recipe is based on one I found in the book My Greek Family Table by Maria Bernadis. Heat a little olive oil in a heavy based pan and cook the meat, onion, garlic and spices over medium heat, stirring constantly. When meat is browned and broken up add the tinned tomatoes and cook further until the tomatoes are reduced by at least half (about 15 – 20 mins). Set aside to cool for 30 mins. Preheat the oven to 180°C. Heat a little more olive oil in a heavy based pan and fry off your eggplant, zucchini and potato (if using) until golden brown. Set aside. Melt the butter in a saucepan, add the flour and cook on a low heat for a couple of minutes, stirring constantly. Gradually add the milk vigorously stirring until smooth before adding more. When all the milk is incorporated and the sauce is smooth, remove from the heat and whisk through the egg. Add the grated cheese and cook, stirring, over a gentle heat until the cheese is also incorporated. Remove from heat and season with freshly ground black pepper. Smear the bottom of a long, deep baking dish with some of the meat sauce, layer the potato, the bechamel and a little of the grated cheese and repeat the layers with first the eggplant and then the zucchini. Finish with the bechamel and some more of the grated cheese. Cook uncovered in a 180°C oven for 35 – 40 mins (turning once) until the top is brown and bubbling. Rest for 10 – 15 mins before serving.